Free fax services have come and gone during the last ten years. Unfortunately, their Web sites and listings in online directories have hung around long after the services went out of business. TPC (The Phone Company, http://tpc.int) is one example of such a ghost. If you check the list of covered areas, you'll find it was last updated in 2003. Today, a fax sent through TPC will just vanish into the ether, almost every time. A number of other free international fax services secretly used the TPC network for all or part of their fax transmissions. If you see a "totally free" international fax service online, you should try a few test faxes with familiar business partners to see if it actually works. FreeFaxButton offers free faxing to 58 countries, with a limit of two free faxes per day. You can compose a simple text-only message online, or upload files in Word (30 KB limit), PDF (50 KB limit), TIF (50 KB limit) or JPG (500 KB limit) format. No ads are attached to your cover sheet but it does bear the FreeFaxButton.com logo at the top. Faxzero.com is one of the best known and well established free international fax services. You can send up to two faxes per day (maximum 3 pages each) to fax numbers in the U. S. or Canada. If you live in Europe, South America or Asia, FaxZero is your best bet for sending free international faxes to the USA. Rates to other countries vary widely; a fax of up to 15 pages costs $3.63 to many European countries, but more to other far-flung locations. The cost is $5.77 to Indonesia, $7.52 to Armenia, and over $32 to Afghanistan. 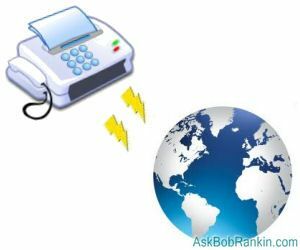 You can view the complete list of international faxing destinations and get pricing info for each. Today, the most reliable free international fax services with the widest coverage are almost all introductory offers from pay-per-fax services. Don't rule out pay services; they're all a lot cheaper than the public telephone network because they use the Internet to bypass those unreasonably high international phone rates. MyFax.com reaches 41 countries, including China and Taiwan. It has a generous 10 page limit per fax, or up to 10 MB in an uploaded file. MyFax.com supports 178 file types from popular word processor and graphics applications. With a bit of luck and some Googling, you may be able to find websites scattered here and there, offering free international faxing to specific countries or cities. It's important to get the format of an international phone number right when faxing. Each country has its internationally recognized country code, i. e., 1 for the USA and 44 for the UK. The country code must precede the phone number. So to fax to 303-555-1212 in the USA, you would use 13035551212. To fax to the same number in the UK you would use 443035551212. For online faxing you must omit any international calling access codes required by your regular telephone service; use only the country code and phone number. Lists of country codes are on all of the fax service Web sites mentioned here. How Secure is Internet Faxing? What Is a Fax Server? Most recent comments on "Free International Fax"
One of the best providers of online fax service is Popfax.com, and it's really reliable and very useful. For urgent sending you can use FreePopfax.com. To call or send fax to another country you must enter 011 first (a kink of access code or something). So, to send a fax to that number in the UK you should use 011-44-303-555-1212.